Ah, the dilemma of home center lumber. We’ve all heard from the curmudgeons who would never buy their lumber from a home center and are appalled that anyone else would either. But is home center lumber really that evil? I don’t think so. 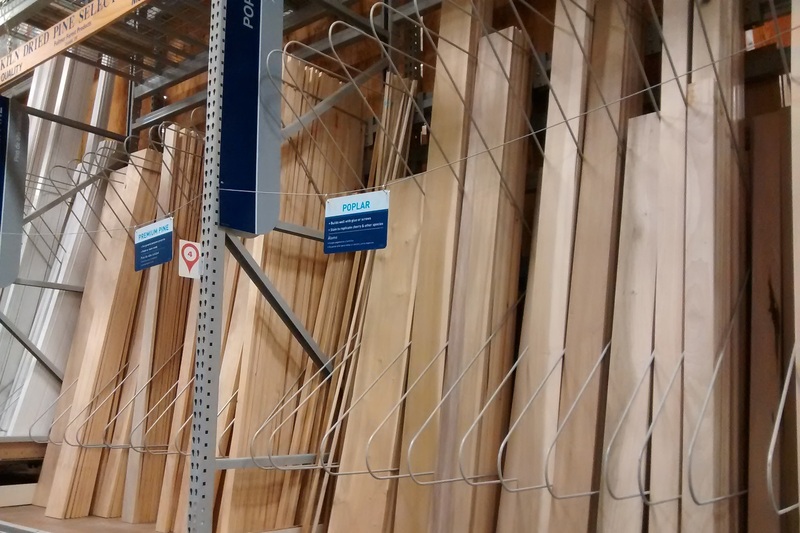 My local home center carries oak, poplar, and radiata pine in the premium lumber section. I’ve also bought maple from home centers, and I’ve heard rumors that some even carry walnut. In my opinion, there’s absolutely nothing wrong with the lumber from the big box stores IF you don’t mind paying their prices. In terms of the quality of the lumber itself, it’s the same stuff you get from a hardwood lumber yard. The main difference is that while most lumberyards sell their stock rough sawn, the stuff in the big box stores is already surfaced. This can be a good thing if you’re just starting out and you don’t have access to a jointer and planer, or if you aren’t yet comfortable hand planing your stock flat and square. It also means that you can see exactly what the board looks like. Sometimes, it’s tough to really see the surface of a board at a lumber yard through the fuzzy rough sawn surface. I’ve already paid a premium for walnut that was labeled as highly figured at the yard, and been very disappointed when I planed it at home to reveal fairly plain walnut. There are two main downsides to the lumber at the home center. First, it’s typically way more expensive than buying from a mill or typical hardwood supplier because you are paying for the convenience and the distribution costs. However, if you’re only in need of a single board, the price difference may be worth it to you if you have to travel an hour or more to get to a mill or hardwood dealer. The other downside to home center lumber is that it is already planed to 3/4″ thick. If you need your boards to be 3/4″ thick and very flat, this can be a problem. Often, especially in wider boards, you’ll find some cupping. So in order to get the board dead flat, you’ll have to plane it thinner than 3/4″. If you can deal with stock less than 3/4″ thick, then you should be fine at the home center. But if you need dead flat stock at 3/4″, or thicker, you’re better off buying rough milled and surfacing it yourself. 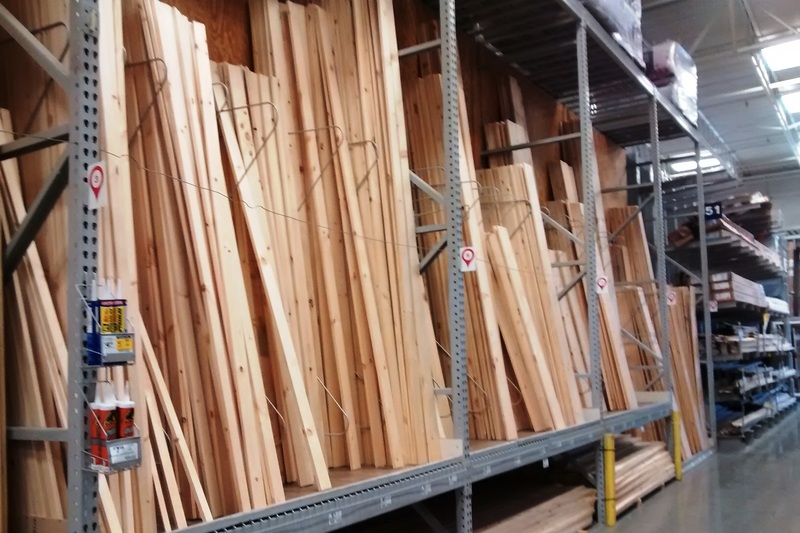 The selection of eastern white pine at my local home center is pretty good, and I can pick through to find just the right board. There’s one exception to the general rule that home center lumber is expensive. That exception is the eastern white pine. I buy most of my pine from the big box stores because it works out cheaper for me vs. buying rough sawn stock from the hardwood dealer. In most cases, I’m OK with the pine not being perfectly flat, or having to plane it thinner, because of how I’m using it. So for me, the cost savings is a bonus in this case. I don’ know if all home centers country wide are carrying eastern white pine in their common pine racks, but most of the stores that I’ve been in on the east coast do. The primary benefit of going to a hardwood lumber yard is the greater variety and the knowledge of the staff there. Also, because you are typically buying rough sawn stock, you can squeeze more thickness from a board if you have the means to plane it yourself. Most lumber yards can plane it for you, but it costs extra – sometimes a lot extra. When you factor this in, the price may not be much different than the big box store. Still, as you gain more experience and you desire more from your lumber, the mill or hardwood dealer will offer you more choices and will likely be the better option for most of your lumber needs, even if it’s not the closest option. For the question above, however, I think the lumber at the big box store is the perfect solution. When I hear boxes for books, I picture something like a crate. This screams home center pine to me. It’s cheap, it’s lightweight, and it’s plenty strong for this kind of project. It’s what I would be looking for if I were building these kinds of boxes. Posted in Materials, Wood and tagged home center lumber, oak, pine, poplar. Another great post Bob. In a recent project I used Southern Yellow Pine from the Big Box and found it great to work. I purchased 2×10 material and broke it down as required. I think taking the time to choose the right pieces of material at the yard or in the store is the biggest factor towards satisfying results regardless of the source. Absolutely! I’m really picky about my lumber. Especially when shopping at the home center. On more than one occasion I’ve picked through their entire selection of white pine only to put it all back and walk out with nothing. That’s a pretty rare occurrence though. Usually I can find at lease one board worth taking home. I agree with you, that there are pluses and minuses to both. Lately, the lumber selection at the Borg has been horrendous!! Overpriced and quality is sub standard. Just a few years ago the quality of the stock was much better and for a cheaper price. Why is lumber seem so expensive recently? Anyway, your comments are spot on. I personally use the lumber yard, but to your point will occasionally buy a few pieces from the home centers. The construction grade stuff has been terrible at my local store recently, so I’ve been buying that from another building supplier near me that carries #1 SYP as opposed to the #2 stuff at the home center. But the white pine at the home center has been OK. And the oak and poplar are almost always clear and flawless, but really expensive. I have enough oak anyway, so I never buy that from the home center. Poplar on a very rare occasion, but that’s so easy to work and so cheap at the lumber yard that I will only ever buy it at the home center if I’m in desperate need on short notice and it’s only a very small quantity. These days, I’m usually only getting my pine from the home center. Couldn’t agree more Bob! My neighbor recently asked for some help on a project. From start to finish we made a table for his daughter in about five hours. That includes a trip to the home center to buy supplies. There is no way we could’ve done that with rough lumber from a hardwood dealer. It’s three hours round trip and that doesn’t include milling the stock. I would also like to point out that over here in the western suburbs of Cleveland, OH we have maple and walnut next to the poplar, oak, and clear pine. I couldn’t believe it when I saw it starting last year. And here’s a quick tip: check the scrap bin. I’ve picked up several offcuts of figured/curly maple for a few bucks. They make great boards for bowties, veneers, or small boxes. Good stuff Bob. Glad to see the blog being more active. Thanks! Really trying to get back to it. I find it especially therapeutic given the situation we’re currently going through with [not] building our cabin. I have a fantastic hard wood and exotic lumber yard 10 miles from home, but sometimes the home center is the right place to find what you need. And i used to buy all my lumber there because i didn’t have the means/skills to dimension and prep stock appropriately. I found curly maple all the time. At least at Menard’s, i’ve seen the standard species of red oak, poplar, and maple as well as hickory, walnut, mahogany, and rough milled birch. They also carry 5/4 pine which is handy. I love wooden furniture! I think that it is very timeless. Not only that but it’s very practical, comfortable, and sturdy. It can be used indoors but is so versatile that with the right finish, it can be outdoor furniture as well.